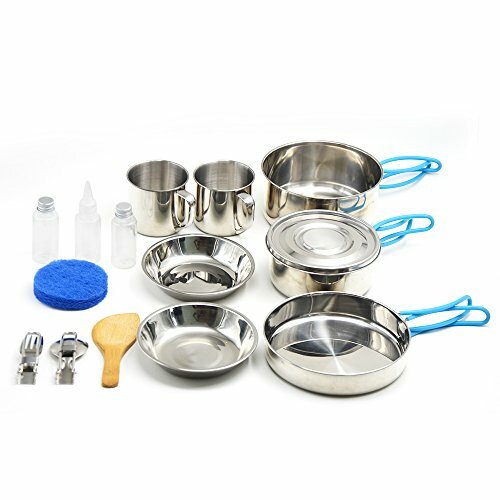 Product Contents:1 x Small Pot (Dia.5.3"x H2.8") 1 x Medium Pot (Dia.6.5"x H3.5") 1 x Large Pot (Dia.7.5"x H4.7") 1 x Pan (Dia.7.7" x H2.2") 5 x Bowls (Dia.4.2") 2 x Medium Plates (Dia.6.5") 1 x Large Plate (Dia.7") 1 x Soup Spoon 1 x Rice Ladle 1 x Loofah Sponge 1 x Mesh Storage BagMaterials: Pot & Pan: aluminum Bowls & Plates: PolypropyleneSpecifications: Packaging Dimension: 8" (L) x 8"(W)x 5.5"(H) Product weight: 2.9lbsSeller Warranty: 60Days 100% money-back guarantee. Any product problem, please let us know without any hesitation. Please click the contact seller customer service for help by choosing "product details" subject to tell us the problems. WELCOME TO ChanglianI guess you like camping, that is great !I also like it, I often go hiking once a week. So I know what we really need.Please give me a little time,let me introduce our products to you. 1.What is the weight as you would take it on the trail?The weight is 328g and I think it is easy to take it when you camping.2.How many liters is the main pot? Pot Size (D*H): 5.9"x 2.83"(approx. )Pot cover diameter:5.43(approx. )3.Can you use this on a campfire?Yes, But must pay attention to the size of the campfire to adapt to the pot body, so as not to burn and burn the handle.4.Would this be a good kit for traditional backpacking Absolutely... it's extremely light weight and compact. Lightweight and a lot of utility in a compact package. I have used this with MSR Whisperlite with amazing resultsAre you rocked? Also if you have other questions, please ask us. We will have responded to within 24 hours.Now we have a period of promotion. Look forward your purchase. Best wishes for you! 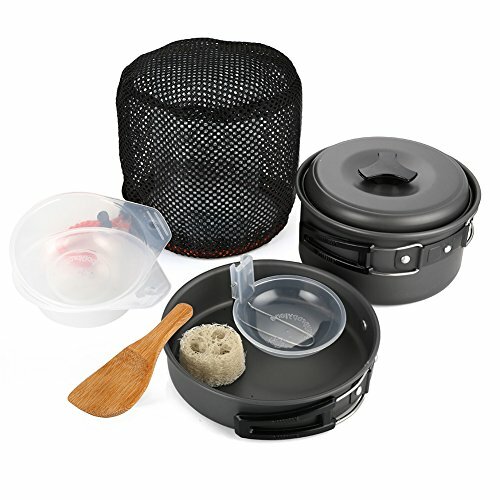 Want to cook your meal when camping or hiking? 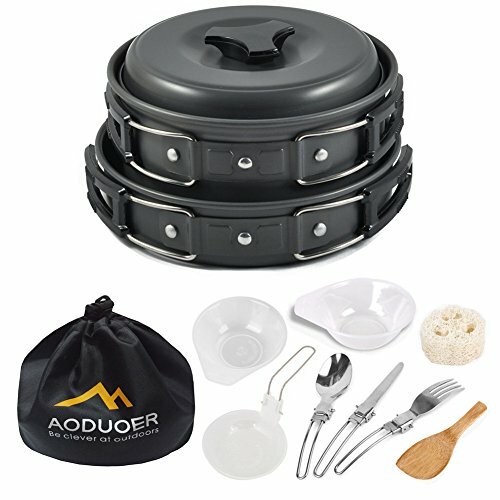 Aoduoer Camping Cookware Mess Kit make your cooking easy and save time. 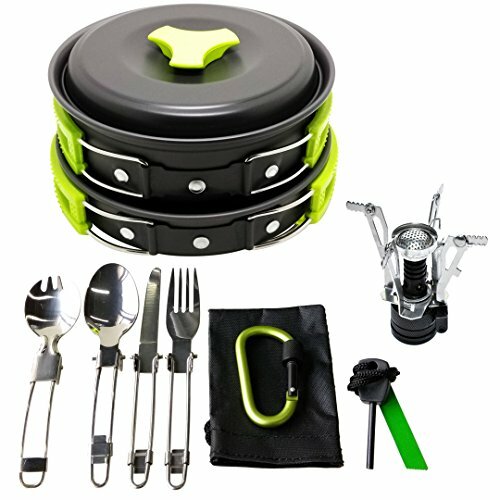 - Outdoor camping cookware set for 1 youth scout or adult hiker. 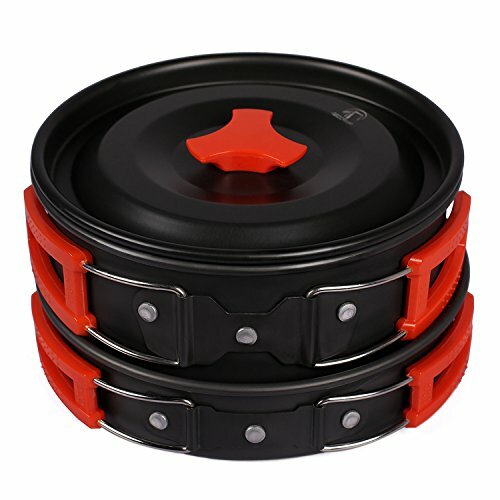 - Camping pot & pan are made of FDA approved anodised aluminum, whick make it heat quickly and durable. Bowls and soup spoon are made of BPA-free plastic. 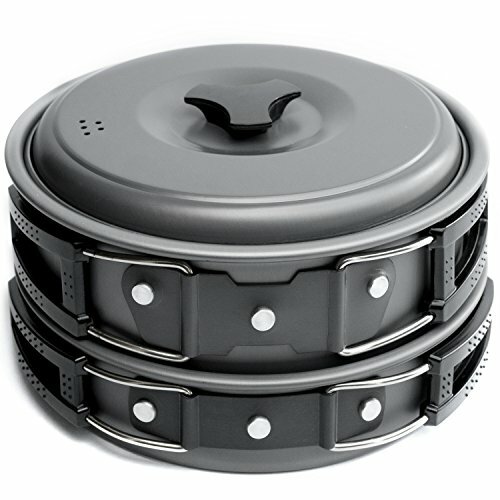 Lightweight and safe cookware for outdoors, hiking, climbing, Backpacking and Picnic. 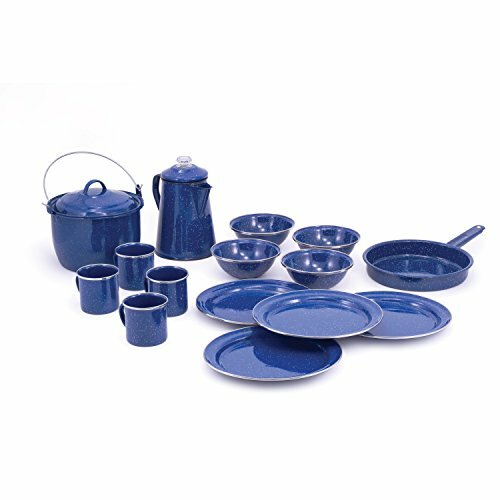 - The utensils and the handles on pot, pan are fodable. 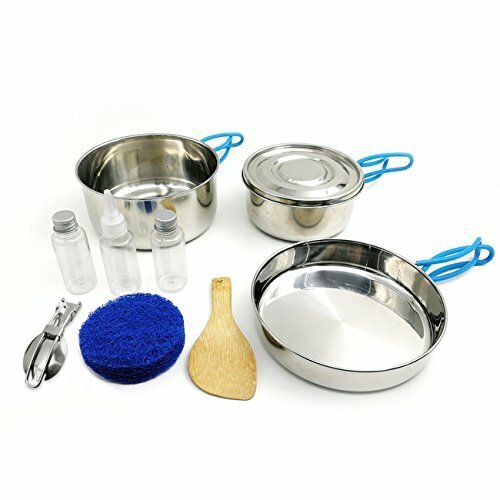 All 13piece camping gear cookset can be stored a mess bag, which save lots of space and easy carry.You can put this camping cooking set inside your backpack or hang it outside backpack. - With anti-skid lines on the pan & pot handle, you can hold them firmly and comfortably. Heat insulation handles protect your hands from scalding. - Best value set with free utensils. Perfect gift for your family or friends. 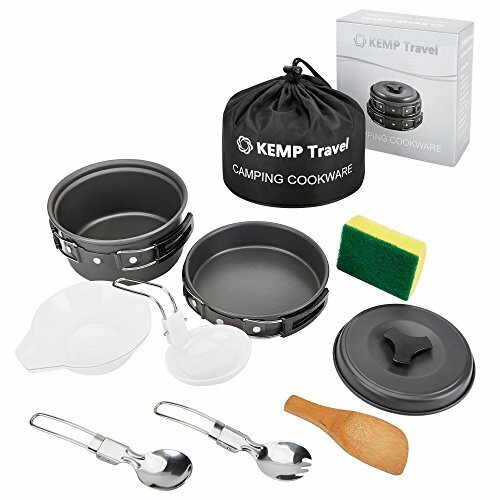 13Piece Camping Cookware Set Package Non-stick campfire cooking pot Non-stick frying pan, pot cover 2 BPA-free bowls BPA-free soup spoon Wooden spoon spatula Natural cleaning case Carrying mess bag Free bonus folding spoon/fork/knife + utensils bag 100% Money Back or Replacement Gurantee. 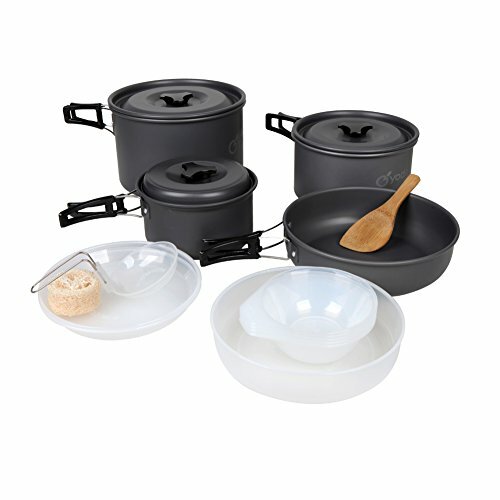 CLICK ADD TO CART to purchase your CAMPING COOKWARE now!